Rekorderlig Cider are back with another impressive pop-up after last year's excellent Winter Forest Bar. This one includes cider, cocktails, and a barbecue. Tickets are £10, and for that you get lots of things to taste and try. "Last year Rekorderlig Cider launched the Winter Forest pop-up bar situated in the heart of East London's Brick Lane. We transferred the Truman Brewery into a magical Scandinavian hideaway, serving authentic Swedish food and cocktails, made from using different flavours of Rekorderlig. The Forest Bar ran for two weeks, injecting London with some truly Scandinavian culture. Since the Forest Bar was such a success, we decided to bring the essence of Swedish summertime to England! Midsummer (introduction of the summer) is a huge celebration in Sweden, marking the start of long, lush sunny days and very little darkness (what a dream!). Although I can't promise the sunshine, I am very excited to introduce, and invite you to the long awaited pop-up Midsummer Swedish House event taking place from June 21st - 5th July in Victoria Park. 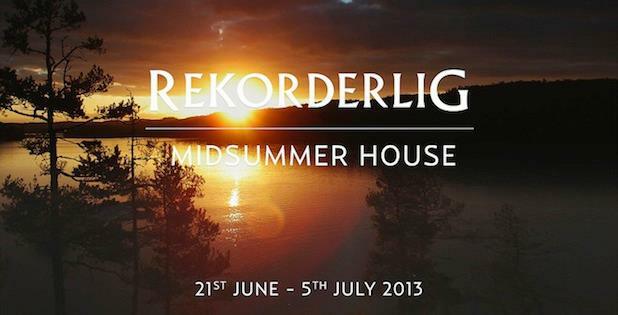 Prepare to be transported to a Scandinavian midsummer meadow overlooking the lake, where you’ll discover exclusive Rekorderlig cocktails and barbecued food pairings in a Beautifully Swedish surrounding. Tickets include a Rekorderlig Cider and a taster from the Swedish inspired BBQ menu."